Do you know the history of Ramayana? Maharaja Dasaratha had three hundred and sixty queens, but no sons. One day he went hunting, and in the evening he met a friend of his who was a king. The king had a very beautiful daughter named Kaikeyi, and he engaged her in serving Maharaja Dasaratha. Maharaja Dasaratha was very pleased with both her services and her beauty. He requested his friend, the king, "Please give me your daughter in marriage." The king said, "My daughter is very precious to me. Only if you promise that the son born from her womb will become king after you, will I give her to you in marriage." Maharaja Dasaratha began to laugh and said, "I have so many queens, but no sons. Therefore, I would be very happy if the son born by her becomes the next king. The king arranged for their marriage and then they returned to Ayodhya. Many years passed, and still no son was born from any queen. The sage Vasistha told Maharaja Dasaratha, "There is no son in your destiny. However, if you will perform a sacrifice called putresthi-yajna, a son may come." A fire sacrifice for begetting a son was then performed by a very great sage named Srngi Rsi. Agnideva, the demigod of fire, soon appeared from that fire with some very delicious sweet rice in his hand. He told the king, "If you will give this to any of your principle queens, she will at once become pregnant and soon have a son." King Dasaratha became very happy; he gave half the sweet rice of Kausalya and half to Kaikeyi. The two queens saw that Sumitra had nothing, so they each divided their parts in half and gave that half to Sumitra. Kaikeyi, Kausalya and Sumitra thus gave birth to four beautiful sons - Rama, Laksmana, Bharata and Satrughna. What is the deep meaning of this sacrifice, wherein the demigod of fire came and gave sweet rice to them? It means that when the Supreme Lord or His manifestations come down to Earth, they don't come through ordinary, mortal persons. Agnideva brought the power of Krishna in the form of Rama, Laksmana, Bharata and Satrughna via the sweet rice, and thus they descended. Rama appeared four-handed, not two-handed, holding a conch shell, disc, lotus and club, and everyone present began to pray to him at that time. Later, when the boys became about five years of age, they were sent to the Gurukula of Vasistha Muni. After a few years in Gurukula they became very expert in all subjects, and then they returned home. After some time, a saint named Visvamitra Muni came to the palace and requested Maharaja Dasaratha, "Please give me Rama and Laksmana. I want to take them to my asrama, because there are many demons there disturbing me and the other sages in our performances of sacrifices for the world's welfare." Maharaja Dasaratha replied, "They cannot go. I will go instead, with all my soldiers. Rama and Laksmana are just young boys. How can they guard your sacrifices?" Visvamitra replied, "You will not be able to help in the matter, but your sons, Rama and Laksmana, are qualified to guard and kill all the demons." Maharaja Dasaratha was still not ready to give them, but his guru, Vasistha Rsi, told him, "You should give your sons to Visvamitra at once. This is for the benefit of you, Rama and Laksmana. They are very fortunate to be with Visvamitra, and later on you will realize this. Following the order of his guru, the king sent his two sons. Later, when the sage began his sacrifices, a lady demon along with her two sons, named Marichi and Bahu came and began creating great disturbances. 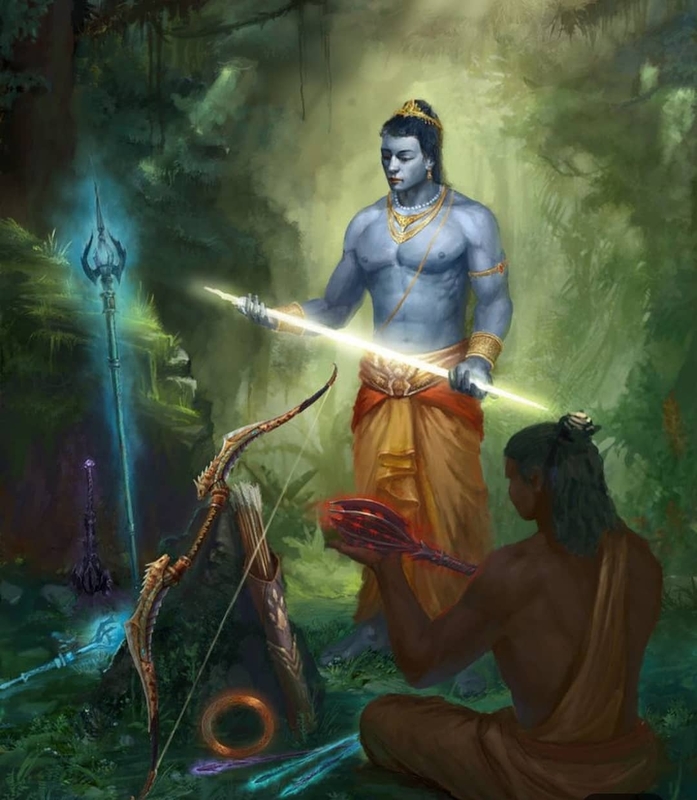 Lord Rama took hold of his bow and arrow and shot them. The mother and one of her sons was killed, but the other son escaped and fled to the island of Lanka in the ocean. After killing several demons, Rama and Laksmana crossed the Ganges River with Visvamitra Rsi and went to Janakapura, the kingdom of King Janaka. King Janaka was a very learned and advanced spiritualist; He realized brahman, the impersonal aspect of God, and Krishna, the Supreme Lord Himself. He had a very beautiful daughter named Sita. He vowed and announced, "I will marry my daughter to anyone who can lift the bow of Lord Siva, which is in my possession, and shoot an arrow from that bow. Many princes and kings came from various parts of the world and tried to lift the bow - but they could not do so. It was so heavy that even thousands upon thousands of soldiers could not lift it. Even Ravana, the powerful king of Lanka, came and tried; and even demigods could not lift the bow. Visvamitra brought Rama and Laksmana to that place, and Rama very easily lifted the bow. He wanted to shoot an arrow from it, but it broke in pieces as he tried to do so. Rama was now victorious, and he thus won the hand of Sita devi, the daughter of Janaka Maharaja. She put a garland on the neck of Rama, Rama also garlanded her, and their marriage was performed. Maharaja Dasaratha came from his kingdom in Ayodhya with his other sons to attend the function, and his three sons also got married there. After that, the newly married couples returned to Ayodhya and they all looked very beautiful. Maharaja Dasaratha had long before given two boons to his wife, Kaikeyi, and she had said at that time that she would ask for them at a later date. By the will of god She now ordered, "My son Bharata should be king and Ramacandra should be sent to the forest in exile." Hearing this, Maharaja Dasaratha became very afflicted by the anticipated separation, and soon after Rama's departure from the palace he died. Now in exile, Rama, Laksmana and Sita went to Citrakuta and other places. Satrughna and Bharata had not been present in Ayodhya at the time of the exile. They were at their maternal uncle's house. When they returned to Ayodhya and found out what had happened, they went to Citrakuta and Bharata told Rama, "You should return home. I will not be king. I am your younger brother." All the inhabitants of Ayodhya had also gone there to appeal to Rama to return, but he refused to return. He wanted to follow his father's orders. Bharata said, "Then please give me your sandals. They will act as your representative. You will be the king, and until your return I will be like a minister and manage everything for you." Lord Ramacandra, Laksmana and Sita then traveled to Dandakaranya forest. Ravana later went there and kidnapped Sita devi. Rama became maddened in separation for her, calling out, "Where are you, where are you?" Ravana took her to Lanka, to a very secret place, and practically nobody knew where he had taken her. By the order of Rama the monkeys, led by Nal and Nil, made a bridge to Shri Lanka. They brought mountains and large stones. They wrote Rama's name on them, threw them in the water - and the stones floated. When half the bridge was completed Rama began to think, "What a powerful name this is! The monkeys are writing my name on the stones and throwing them in the water - and the stones are floating! I should also take a stone and throw it in the water, and I should see if it floats or sinks." Hanuman began searching for Shri Rama, and finally he saw him from a distance and thought, "Rama is hiding in a grove." He went there and asked, "Why are you here?" Rama replied, "I took a stone and threw it in the ocean, but it sank. When the monkeys write "Rama, Rama" on the stones and throw them in the water they float. Why is that?" Hanuman said, "There is a secret. The monkeys utter your name and then the stones float, but whose name will you call?" What was used in the service of the Lord floated and what the Lord threw away became dead weight. The holy name is more powerful then Lord Rama or Lord Krishna Himself. Chanting of the name will do everything. Nothing else can save you. 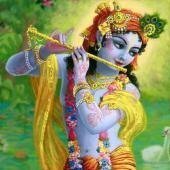 If you want to be happy in your life, chant Hare Krishna Hare Krishna Krishna Krishna Hare Hare, Hare Rama Hare Rama Rama Rama Hare Hare. This is more powerful than Rama. Rama is very powerful, but these names are more powerful. Lord Rama then crossed the ocean with his monkey army and killed all the demons under Ravana's leadership. He only spared Vibhisana, because Vibhisana was a devotee and favorable to Rama. Ravana and all his sons were killed. When Sita was presented to Rama, he said, "I will not take Sita with me. I am a ksatriya king. I did not come here to take Sita back. I came to destroy all of Lanka, because Ravana kidnapped her, but because she was in the house of Ravana I cannot accept her." He ordered Laksmana to build a fire in order to test her chastity. Sita prayed, "O Agnideva, O demigod of fire, I will enter the fire, and if I am pure I'll not be burned." She entered the fire and Agnideva came out with her and said, "She is pure." The air-god then appeared and said, "I am everywhere. I know Sita is pure." Rama took Sita and returned to Ayodhya with his new associates like Vibhisana and Hanuman. He was given the kingdom on that day, Rama Navami, which happened to be the day he was exiled and also happened to be the same day as his birth. The residents of Ayodhya performed an abhiseka ceremony to install him as king. Sita had a desire to see the rsis and maharsis. In the meantime, some of the inhabitants of Ayodhya began to say that although she was not pure, Rama still took her back. They concluded, "This is a very bad thing." Rama then sent Sita into exile, although she was pregnant at that time. She went to the asrama of Valmiki, where she gave birth to two sons, named Lav and Kush. Her sons were very strong and powerful. Valmiki was very expert in archery, and under his tutelage the boys became even more expert than Shri Rama. Valmiki also trained them in singing the Ramayana, which he had written before the pastimes of Rama were manifest in this world. In the meantime, Rama was very distressed in separation from Sita. He was always lamenting and there was no one to console him. Like Sita, he ate only fruits and did not sleep on a bed. Shri Rama told Visvamitra Muni, "I want to perform an asvamedha-yajna (horse-sacrifice). Visvamitra said, "You cannot do this because you have no wife. The wife must be present in order to perform this ceremony. You should bring Sita here." Rama said, "I cannot, but I still want to perform this sacrifice." Visvamitra said, "Then you should marry another lady." Rama replied, "I cannot do this - Sita will be my only queen." A golden statue of Sita was then made and installed, seated on Rama's left, and Rama began to perform the sacrifice. In the morning he arranged for the performance of the fire-sacrifice, and at midday there was hari-katha and recitation of scriptures like the Puranas. In the meantime, Valmiki told Lav and Kush, "You should sing my Valmiki Ramayana there." The boys were about nine or ten years old, very beautiful and strong, and, as previously mentioned, expert at archery. It has been told that they defeated Hanuman and many other powerful personalities in archery; and even Rama once came and they defeated him. The boys knew that Rama was a king, and they knew that his wife was Sita, but they did not know that Sita was their mother. They only knew of their mother as "Vana-devi". When they arrived at the sacrifice they began to sing in such a sweet and melodious way that all present in the assembly were attracted. All began to weep by hearing that Ramayana. Rama told Laksmana to find out the name of their father, and to give them nice gifts of cloth and golden ornaments. Laksmana told them, "Maharaja Rama wants to know the name of your father and mother." Lav and Kush replied, "We cannot tell. You are supposed to be learned. You should know that brahmacaris do not tell the name of their mother and father; they should only tell the name of their guru. Valmiki is our guru." Laksmana became very ashamed and said, "I want to present you these gifts from Rama." They said, "What will we do with these? Please keep them. In the asrama we eat fruits and wear the bark of trees made into cloth. Return these and tell Rama we don't want them." This made Rama still more impressed. Rama came to know that Sita was in the asrama of Valmiki and the boys were his sons. He called Valmiki and said, "It seems that they are my sons and that my wife, Sita, is there with you. Please bring her. I want to accept her again. The demigods confirmed it in Lanka and my father also confirmed it, but she will also personally have to produce some evidence that she is pure." Sita came the next day with her two sons. All were weeping and lamenting for Sita when they saw her, and they were discussing amongst themselves that Lav and Kush are the sons of Rama. They said, "The boys are just as beautiful as Rama. The only difference between them and their father is that they are younger." Rama told Sita, "I know that you are pure; I realized it in Lanka. But I want you to give personal evidence that you are pure." Sita said, "Still, you want evidence? All right, I will quickly give you evidence." She prayed to Mother Earth, "I've come from your womb. Please open up and take me on your lap. If I have not touched anyone in this world by mind except for Rama, then come and take me." After she said this three times, the Earth at once divided, a beautiful golden throne came out, and upon that throne was Prthivi-devi, Mother Earth. She took Sita on her lap and they both went back into the ground. Weeping loudly, Rama called out, "O Sita, where are you? I cannot survive without you." He took out his bow and arrow and said to Mother Earth, "You are the mother of Sita and you are also my mother. But if you do not return me wife, I will shoot and destroy you." Valmiki told Rama, "I have written up to this point, and not after that. Sita has gone to your abode. Go there and see that she is waiting for you. This is only your pastime. The entire world will hear it, weep and remember it. Now the time has come. Please go at once, taking all those with whom you came. They went to the river bank, took bath, and all assumed four-armed Visnu forms. All the inhabitants went to Ayodhya with the four brothers, in the realm beyond this world.